Too bad we didn’t film this listening session. 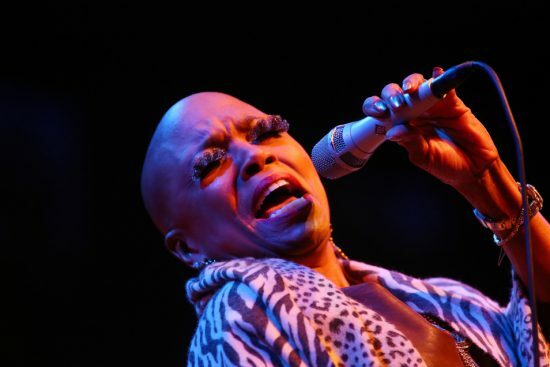 To see Dee Dee Bridgewater’s animated facial expressions and watch her respond, both physically and emotionally, would add an extra layer or two of meaning to the text. I caught up with the peripatetic vocalist (and her little Maltese, Ayo) at her hotel in Washington, D.C., a few hours before her performance with the Monterey Jazz Festival on Tour band. The actress and three-time Grammy winner, 62, continues to host NPR’s JazzSet while pursuing her intercontinental musical adventures. Her latest recording is the compilation Midnight Sun, released through her own DDB Records. “Thou Swell” (from Meet Betty Carter and Ray Bryant, Columbia). Carter, vocal; Bryant, piano; Wendell Marshall, bass; “Papa” Jo Jones, drums. Recorded in 1955. BEFORE: Betty, man. She was so friggin’ underrated. She was a genius. I mean, just the way she heard music and how she could take a simple song like “Thou Swell” and turn it into a masterpiece of the moment. The trio was so tight and she just floats on top of it like a horn. People say they’re inspired by Ella, Sarah and Billie, but she’s my main inspiration. She was a part of the band and yet she led the band. She produced her own music, had her own label. She did her own distribution with Bet-Car Productions. If I’m producing today it’s because of Betty Carter. Did you get to know her? Yeah, I spent time with her. I was her shadow for the first two years that I was in New York. Even when I was doing [the Broadway musical] The Wiz, wherever she was performing in New York, if I could go, I’d go. And I’d always go by myself because I didn’t want to be disturbed. I went to her home when she was living in Brooklyn, next to the Brooklyn Academy of Music. She went through a period when she was toying with singing behind the beat, and she would be so far behind that I’d think she was lost, but the band kept playing and then bam!-she was right there. I love Betty Carter. Thank you. That was a great way to start. “I’m Going to Live the Life I Sing About in My Song” (from Much in Common, Verve). Brown, bass; Jackson, vibraphone; Marion Williams, vocal; “Wild” Bill Davis, organ; Kenny Burrell, guitar; Albert “Tootie” Heath, drums. Recorded in 1964. BEFORE: Mmm … woo! I don’t know who this is. Got church. Uh, huh. The voice kind of reminds me of Mahalia Jackson-an amazing voice and great control. She doesn’t even have to force her voice. She’s got the feeling. I love the music. I like the churchiness of the organ and the jazz vibe on top. It’s fabulous. It’s a great amalgam of gospel, blues and jazz. But this is a gospel singer. I get goose bumps. Who is this? AFTER: This is Marion Williams? Wow. The combination was great. What an incredible voice. Fantastic. She took me to church. She was uplifting. And the way she used her vibrato with such control, it made me feel like, “Wow, I wish I could sing like that.” I hear joy in her voice, but it’s a spiritual joy. Thad Jones told me to never listen to singers so that I could develop my own voice, so I never really did. But listening to her, I need to download that, get that album. What a wonderful surprise. What have I been missing? I was raised Catholic, so I didn’t join a black church till I was an adult in my late 20s, early 30s. I always felt growing up that I had missed part of the black experience because of where I went to school; I was one of only 3 or 4 black kids. I always loved gospel. So I want to deal with that. I could listen to this on the [tour] bus. “Get Out of My Life Woman” (from Presenting Joe Williams and Thad Jones/Mel Lewis, the Jazz Orchestra, Solid State). Williams, vocal; Thad Jones/Mel Lewis Orchestra. Recorded in 1966. BEFORE: [immediately starts to clap and sing along with the arrangement] Yes, baby! I’m lucky I got to sing this arrangement. Joe was so bad. Hey! [whooping and hollering] Yes, Joe. Hey, baby, wow! This is the music that formed me. That band, the way that Thad could dissect a big band and give you these mini-ensemble things. I just watched him take arrangements and totally redo them as the band was playing. He was brilliant. It makes me feel like I need to go back and listen to Thad some more, because he shaped my whole notion of sound. If I go back and listen to his albums it might help to give me some more clarity for explaining how I’d like arrangements done. His arrangements never felt boxed in. They were liberating. As a singer, you have this amazing cushion of sound that would push you along and get you excited. He provided all these colors and you just had to go with it. And I always thought Thad and Mel with Joe Williams was such a great pairing. Joe never tried to do vocal gymnastics. He’d just tell the story with a great sense of rhythm. It was like molasses on top that dripped all into the seams. So the combination was great. When you were with Thad and Mel, did Thad tailor his arrangements to suit your voice? I sang “Get Out of My Life” with them, but I didn’t sing it like that. That was funky. Thad was funky. As a musician or as a person? Both. He was such a character. He and Elvin were alike. Their personalities were larger than life with those big laughs. When they walked into a space, they just took the space. They became the center, the light, the focus. Thad was very charismatic: a big man, barrel chested, he would hug you. Hank was always cool and dapper and restrained. I miss Joe Williams. He had the blues and the jazz and an amazing instrument. He always sang with such ease. He would stand there, totally debonair and soulful. “Get It Right” (from Words and Tones, Vix). Wooten, basses, backing vocals; Meshell Ndegeocello, lead vocal, electric bass; Saundra Williams, backing vocals; Divinity Roxx, rap; Joseph Wooten, keyboards, backing vocals; Derico Watson, drums. Released in 2012. BEFORE: Like the bass. Oh, I like the mix, all the layers. I like how she’s got the bass out front but not too out front. I love the song; I love Meshell’s playing; I love the lyric. But I love how the bass is right in the center, with all these layers around it. And everything is so clear. Mixing is so important to me, so that was very cool. I’ve never listened to Meshell. I played with her: We were part of an evening at the Barbican in London called Billie and Me, with Amy Winehouse before she blew up, and Neneh Cherry and Fontella Bass. AFTER: So this is Victor Wooten’s record? Is this new? I don’t know him at all, just the name. Can I hear this again? The drummer is great. I like that music has morphed into something jazzy, funky, so you don’t always know what it is. But this is Meshell singing, right? [starts singing along on the chorus] It’s just cool. I like this a lot. It’s very today, with a subtle jazzy thing under it. But you’d have to be from jazz to hear that. Like I say, I don’t really know Meshell. I worked with her once and she had some ego issues and we had to talk, then she was OK. Victor-who has he played with? I’ve got to check him out. As a jazz musician, if I wanted to open up, I’d go that way. I really like that. A lot of substance there. I’m a new fan. You’re taking me to school today. “If You Could See Me Now” (from The Chronological Classics: Sarah Vaughan 1944-46, Chronological Classics). Vaughan, vocal; Tadd Dameron Orchestra with Freddy Webster, trumpet solo. Recorded in 1946. BEFORE: I’ve heard this. As she got older her sound got a little thicker [demonstrates]. I think this was on a compilation of her music that I did for Verve; I chose this. [Ed. note: Bridgewater did select Vaughan tracks for the 1997 compilation Ultimate Sarah Vaughan, but this cut does not appear on that album.] Her voice here is lighter. It didn’t have that operatic quality that you heard in later years. But there’s something in the timbre of her voice that was Sassy. She had a wonderful rhythmic sense and a wonderful range. For me, she was a musician. She didn’t have to always embellish a melody, because her voice was such a beautiful instrument. That was the thing I liked about Sarah. A song that comes to mind is her version of “Send in the Clowns.” Her voice was like velvet. But this voice, the younger Sassy, is such a pure sound. And it’s a real voice; it’s not contrived at all. Yeah. First of all, she had that little-girl speaking voice [imitates it]. She came to see me one time and I was performing at Paul’s Mall in Boston. I was opening for B.B. [King], and she came down with [trumpeter and husband] Waymon Reed. She came backstage and said, “Now I understand. You do sound like me.” And I said, “Really?” I would always go to see her at the Rainbow Grill. I’d get all dressed up. Do you think you sounded like her? No, I didn’t think so. Maybe I could hear where somebody else could hear her in me. Like, I didn’t think I sounded like Ella, or any of these women I’ve been compared to. I can sound like Billie Holiday, but that’s because I studied her to do the play [Lady Day]. So I can talk like her. But Sassy, velvet. If she were here today, what would you want to talk about with her? [long pause] If she were here today, I’d like to talk to her about female things. How it was for her being on the road. How did she deal with her loneliness? How did she deal with having a man in her life, or not having a man? I’d want to ask her personal stuff. I had a wonderful evening with Ella in the early ’80s in Tokyo. I went to see her after doing Sophisticated Ladies and I went backstage because I’d never met her. I knocked and Norman Granz opened the door. I introduced myself and he said, “Dee Dee, I know who you are. Come on in here.” I was really shy. I still am but I know how to mask it. So what did you talk to Ella about? She had money; she was set. Why do you think she continued on the road? What happened is what’s starting to happen to me. I’m in my early 60s-I’ll be 63 this year-and I keep saying I’ve got to get off the road. Now I’m starting to think, what the flock would I do if I get off the road? I don’t want to morph into someone with all-white hair who looks and acts 60, with that world-on-my-shoulders kind of thing. You feel they’ve surrendered and stopped growing and accepted it. I wouldn’t be going around the world to experience all these cultures and eat all these different foods and meet all these different people with different mindsets, and working with young musicians. That’s why she worked up till the day she died. You get used to it and you become a road warrior. Now that I’m getting older, I think I have some things to share with younger singers and musicians. Teaching, maybe. I’ve been approached so many times to write a book. I’ve got a gazillion stories, but I don’t think I’m going to tell them because I have a lot of skeletons in my closet. I’ve got a lot of things that have happened to me or things that I’ve done that only those particular people know about it [laughs]. So if I were to expose that stuff I don’t know what my kids would say. Maybe I could tell some stories without it being personal. But I’ve got a lot of dirty laundry.